Published in Rafu Shimpo, June 1, 1955, Japanese section, and June 3, 1955. 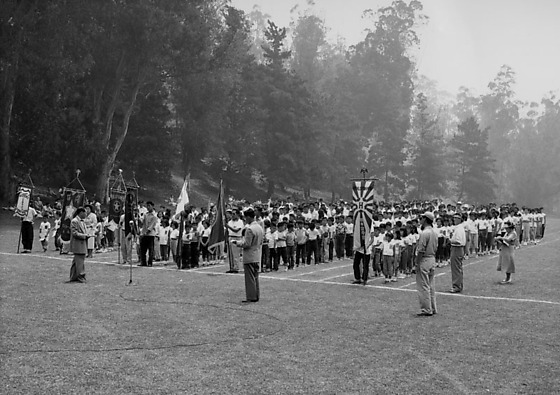 Kyodo System Nihon Gakuen (Japanese school) annual picnic, or Undo-Kai, where games and races are held between eight branches of schools at Elysian Park in Los Angeles, California, May 29, 1955. Includes cheerleaders with pom poms, and children lined up on field behind school banners, such as Midori Gakuen, Valley Gakuen, and Hollywood Nihongo Gakuen. Valley Gakuen came in first, Chuo Weekly in second and Daiichi Gakuen main school in third. Typed on original envelope: Kyodo System -- Nihon-Gakuen Picnic.